No, this is not a new product from those wonderful folks who brought you the Crunchy Frog choccy. This is a jam from Hinton’s Orchard & Farm Market near Hodgenville, Kentucky. Our #2 daughter and her husband stopped there on a visit to his family and brought us back a couple of jams, one of which was FROG Jam. This is made even more delightfully strange by the fact that they’re both vegetarians. 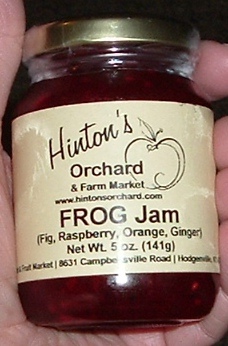 It’s called FROG jam because it’s principle ingredients are Figs, Raspberries, Oranges, and Ginger. Seeds? Dear lord, you might as well eat sand with marmalade on it. But the thought is very much appreciated, especially since I know #2 daughter is, for some reason, very partial to seedy jam. A WRITING PROMPT FOR YOU: What does your main character like to put on toast in the morning? This entry was posted in Food. Tagged gifts. I’m Not too big a fan of seedy foods, either. I love raspberries. And I love strawberries. The jams are just–ridiculously good. SO–you have to find the canners who can balance out the seeds with gooey scrumptiousness. Frog Jam. Isn’t that the name of a band? Frog Jam DOES sound like the name of a band! lol! At first I was like “WHAT THE— FROG? !” Then realized I was wrong. Thank you for sharing this with us. You got me at the title. I was already starting to think about frog innards swimming around in the bottle. Odd concoction though, never have tried figs with fruits. Interesting really. I have never tried Figs, but this jam really looks interesting (aside from the fact it’s called FROG jam, you got me there) Hopefully I can give it a try one of these days. I’ve tried a different sort of jam with figs and I definitely loved it. I’m sure to love this too! It has two of my favorite fruits in it. Who wouldn’t want to have a sliver of it? Marian Allen would love to share..SAGE!